I know this is a little late posting this month, but being away for the holiday really threw me off. Then when I got back, I had everything ready to go, but I've lost my stapler. I went and bought 3 different staplers in the last week and for one reason or another, none of them will work. 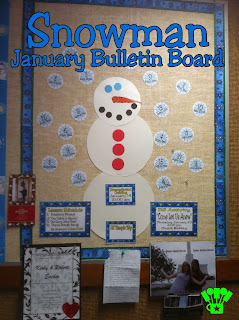 With all the problems, I was super glad I went with an easy theme this month in my January bulletin board idea...snowmen. If you're stuck in the Arctic Vortex or it's after math this month, you might as well enjoy the fun side of the snow and cold and build a snowman. Plus, my sister keeps singing the song from Frozen to me "Do you want to build a snowman?" so I can't get it out of my head. I started with a simple snow themed border. I print them off about 2 inches tall by 11 inches wide. This causes me to need 4 sheets of borders to fit around my bulletin board. 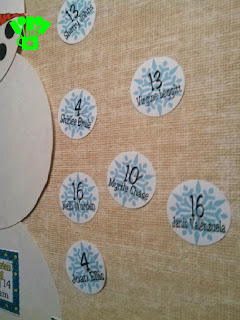 After that I filled the center of my bulletin board with a snowman I made from a large sheet of poster board. Our monthly announcements are inside Star and Snowflake frames. There are two different sizes for the different needs of our board. 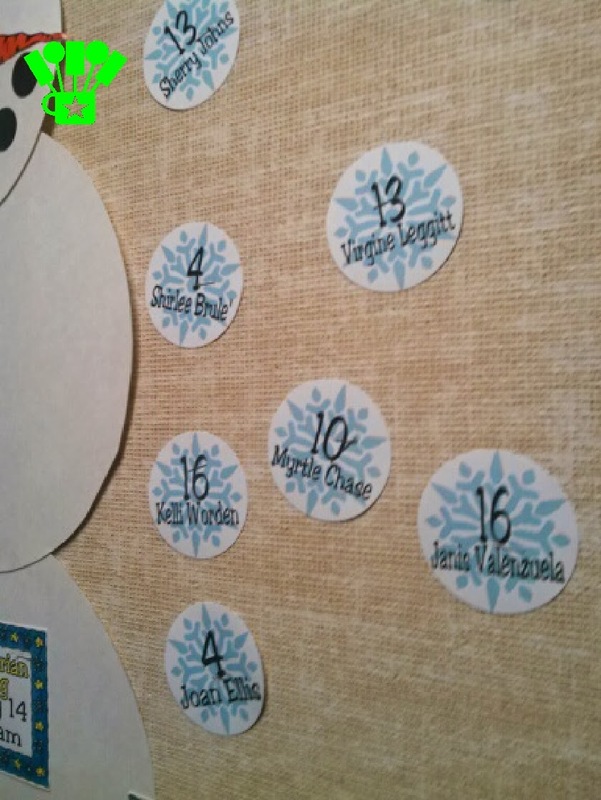 Each month I try to highlight the birthdays that will take place and I find this to be the hardest/most time consuming part of my whole bulletin board. I wanted to do snowflakes to go with my theme, but didn't want to cut out each of the many point to the snowflake. So instead, I sized them to fit my 2 inch punch and just added the ladies' names and birthdates. This made a quick and easy punch. Then I just added the snowflakes around my snowman in a random way. It was a pretty simple bulletin board this month. 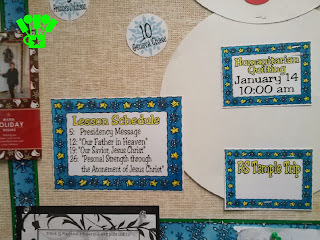 I hope that it gives you an idea or two on making a board for your church or school. If you need the printables, you can find the Snowman Bulletin Board zip file HERE.